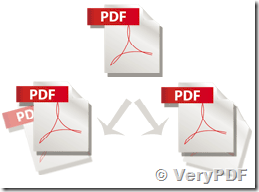 ← How to permanently rotate pdf 90 degree in VeryPDF PDF Editor? We are currently evaluating VeryPDF split-merge tool for our project requirements. In which we need your clarification on how to support one of the feature. We need to know on how to split a single pdf into multiple pdf's with PDF's being generated from specified page numbers. like i have PDF with 40 pages, in which i want split multiple PDF's for pages 5-8, 12-17, 18-27, 28-31, 32,33,34-35, 38.
like, 5-8.pdf, 12-17.pdf, 18-27.pdf, 28-31.pdf, 32.pdf, 33.pdf, 34-35.pdf, 38.pdf. (PDF names are taken for example). Is there any way to achieve the above functionality using Very PDF splitter. You can write a simple application to generate above command lines and call them easily. We need to be able to print the pdf, collating and stapling each individual invoice. Do you have a program that will do this? PDF Merger for Mac question. How to extract pages from different PDF files and merge them into one single PDF file? How to split and merge PDF files from C# source code? This entry was posted in PDF Split-Merge and tagged pdf split, PDF Split-Merge. Bookmark the permalink.